Back in the early '80's I found myself out of the navy, married, with a temporary job and flat broke. Nova Scotia is an area that people often leave to find work while military personal transfer in and out so I also found myself in between wargaming circles. I decided that I needed a new wargames project, a budget one. MPC had just re-released some Airfix kits so I picked up a stack of ACW figures, painted 48 a side (4 x 12 Yankees vs 3 x 16 Rebs, shuffled them aimlessly about the kitchen table with Featherstone in hand once or twice, and then life returned to normal. Those 1/72nd plastics were relegated to this box, then that one then dumped unceremoniously in a big bin of mostly unpainted plastic figures but I couldn't quite let go of them. (My very first sets of Airfix were a box each of Rebs and WWII Russians given to me one Christmas, I played Hungarian revolt with them!) I doubted that I'd ever finish the 1/72nd project, not after building ACW armies in 15mm, and 54mm (I have 200 or more ACW 40mm figs from 4 manufacturers but I'm pleased to say that none have been painted as ACW). Then at Cold Wars 2 years ago I saw a marvelous 1/72nd/22mm game and it got me itching. What do they say? "Look for patterns?" Last week, after another enjoyable 1/72 AWI game with Jerry, we got to talking. Jerry is a 1/72 plastic fan and he had a bunch of unpainted rebs, I still had my 100 painted and another 200 or so unpainted, we both like ACW, so......... 2 days later I just flocked the bases on my 1st unit of Black hats in mid-war campaign dress (ok I painted a bunch of marching rebs in blue, I'm sort of backing into this, I'll figure out who is who as I go along), rebased and flocked the old guys, have been eying PSR and http://www.musketminiatures.com/ and "tramp tramp tramp the boys are marching". I dunno, they may have minor issues but they still hold up to my eye, esp the marching figures. These are the 28 year old (yikes) guys with with basic shading & highlighting completely hidden by a new coat of gloss varnish. Ready for Black Powder or Morschauser Meets MacDuff. 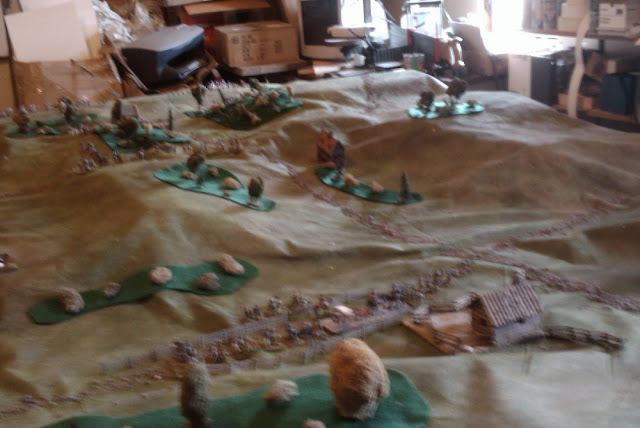 Since the table was set up and with one of the original periods that With MacDuff To The Frontier was written for, and I was working on the 2010 revision, I decided to reset the scenario and try them out. Some of the units were a little small, especially the cavalry, but I decided to work with the units as is. The game started out in similar fashion with Top Hat and his rebels sniping at long range while the convoy trudged forward. Col. MacDuff deployed B company of the Black Watch to return fire while A company pushed across the river and deployed. One of the first figures to fall was MacDuff himself, grazed by a bullet (6 to hit, 6 to hit an officer, 6 again to hit the senior office present!). By turn 3, Prince Kwannabe and the main body of Nku Khu warriors arrived and moved to the edge of the rough ground on the hill and started to work their way through the cover towards the wagons. Captain Britain of the 11th Hussars, responding to orders to advance and protect the flank of the cavalry, spotted the warriors and being too far to request clarification, decided that his duty was to engage the enemy (i.e. he was beyond control range and rolled 6 on the control chart). The 1st troops drew their sabers and charged but the enemy was thicker in the bush than suspected and the rough ground disrupted the charge. Badly mauled, they fell back behind the 2nd troop. By now, the Nkh Khu flanking force had arrived and were creeping up the hill, later than expected but welcome. Rapidly Brigadier Steele deployed first the Victoria rifles and then the New Durban volunteers to hold them off. Behind them, the remnants of the cavalry fell back covered by the fire of the Black Watch. 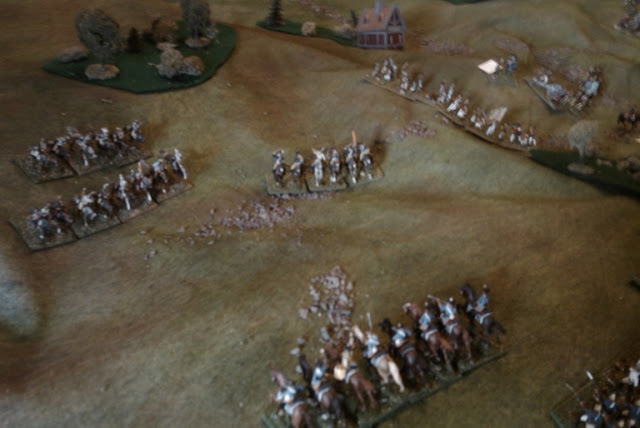 Sensing that an opportunity was slipping away, Kwannabe ordered his warriors forward but the disciplined fire of A company broke the right hand band while the lancers, supported by the light artillery, drove back the center. As the light started to fade, the head of the convoy neared the edge of the table. 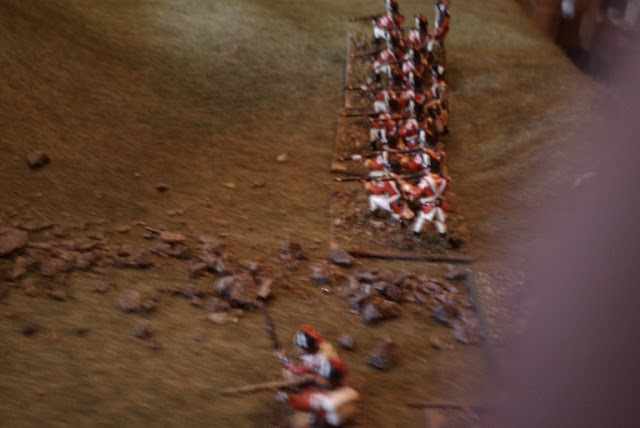 One chance remained, the flanking force surged across the ford, Black Shields leading and crashed into the Volunteers. Every shot told as the warriors closed and after a brief struggle, the Black Shields broke and fell back. Kwannabe still had warriors in hand but he was not one to throw their lives away lightly and the odds were now too long to offer any real hope of success. He waved them back into the brush. This was the first play test of the 2010 edition of MacDuff and so far it was just what I was looking for. The game, admittedly a small one, took about 2 hours of playing time and about 10 turns. The major change was separating the movement and firing into two phases, hardly original but I had been so pleased with not having a separate fire phase, something I had only seen suggested in a Courier article at the time, that I beat my head against the wall to keep it that way although it was the cause of innumerable headaches over how to handle reactions, limit the ability of one side to fire multiple times without reply due to the random sequencing and so forth. Of course, having now met Morschauser who also didn't have a separate fire phase, well its nothing new! A draft of the 2010 edition which covers North American wars as well as Victorian Colonial warfare is available on my website. I know there are some formatting issues and it is inevitable that I will have missed some anomaly but it is ready to be read over and, if anyone is brave enough and interested, to be tried out. All and any feedback is not just welcome but actively sought. while the train rumbles on. I was planning to write this game up but frankly it wasn't worth it so I'll let the captions tell the story and concentrate on comments on the rules. The original teaser is designed for much slower moving rules so I advanced the possible arrival times, essentially counting each turn as 3. Turn 2. The main force arrives and surges across the table while the advance guard cowers. 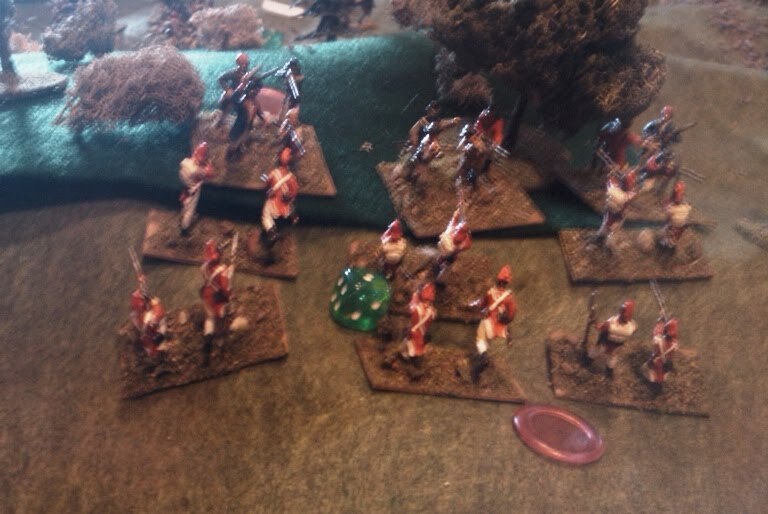 The shooting 1 die per Zulu unit proves deadly with the 1st company of the Black Watch with its flank exposed becoming disordered as well as suffering a hit and the Lancers also being disordered. Luckily for the Brits, the 2nd company was able to come up and cover. 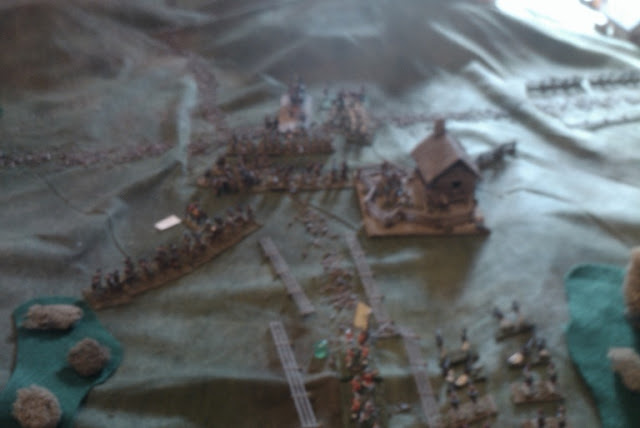 Turn 3, the Zulu flankers miss a chance to come on and the Main Body refuses to charge the open flank. 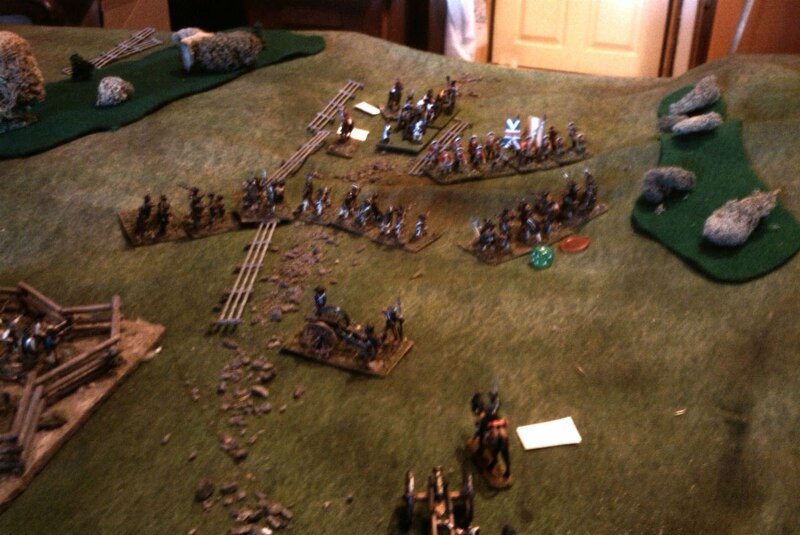 The Brits shuffle and the wagon train charges 3 moves forward. The 4.7" gun team was able to leave the table but since it is standing in for 3 wagons in the original, I just stopped in on the edge to let the Nku Khu have a go at it. On turn 4 the Zulu main body charges in and begins a prolonged melee while the flank guard rushes madly forward and manages to snipe a wagon into disorder. On the British half, the gun moves off table, 1 wagon moves to safety while the other gets screened and 1 unit breaks out of melee while the other falls back. The 4.7" heading for safety. Black Powder is aimed at a table full of troops but since they include a low level Zulu War scenario with a handful of companies, I thought I'd give it a go. This is a rare outing for these troops, they haven't seem much action since I fell for 40mm glossy toy soldiers. I still like the old Britain's style and the Call To Arms Zulus are a good fit for them but having picked who was going on table, I'll admit to still not being keen on the larger new style plastics and metals. Since I am able to base my old Britain's (inc recasts) on 1" bases, they don't actually take up much more space than 28's and I could easily have fielded 20 man British units (2 deep) if I'd had enough Zulus to face them. However, one of my old problems cropped up, the wagon train just takes up too much space so instead of the 8 wagons that the scenario calls for, I settled for 3. Each side had 3 brigadiers plus a general. I was hoping that this would be enough to prevent 1 or 2 command rolls dominating the game. It didn't work. Even though my table is 6 ft by 8 ft, by using inches, the wagon train surged across the table too fast for the natives to have a chance to catch it. Having variable arrival only made it worse. In the event the game moved quickly but too quickly, it lacked the suspense and the build up to a dramatic finish which I am used to in this sort of scenario and I felt fairly superfluous, the whole thing seemed to hinge on 1 or 2 command rolls. With hind sight, a rule saying that the oxen can only move once per turn might have helped the scenario develop but I doubt it, the moves are so long that the natives are in contact in no time then its all down to some dice rolling. The stop/start feel of the command system and random feel of the combat, especially, the paralyzing disorders was only exacerbated by the small number of brigades and the small numbers of units. If I had more Zulus or decided to fudge, disregarding looks, I would double the ranks on the Brits and halve all distances but double the number of companies on each side. This would make the rifle fire feel very short and make the artillery more or less irrelevant but might make the game flow better with command decisions seeming more important and with the game not balancing on the 1st couple of command rolls for the wagons. However, after an enjoyable run through of the Alma river scenario today at Jeff's place using 15mm Nappy's as stand ins, I've had enough Black Powder for 1 week. The table is still set up though and I've just run through the 1st two turns of an original Colonial MacDuff game. Feels good so far but then this is the sort of thing they were written for..
Billy Russell observes an Nku Khu marriage ceremony officiated by Prince Kwannabe on the Royal Rock of Nmuphin when a messenger arrives with news of the approach of the British column. New Durban Police: Rifled Musket Melee 6, Shoot 3, Save 4+, hits 3. Rocket battery: Melee 1, Shooting: 2 Save 4+, Hits 1, pack animals, rocket min range 6" max 60"
* All British units may skirmish. Lancers: -2 to enemy save in melee. Unreliable: No move if orders roll = commanders CV. Well, May is supposed to see the launch of the Lydian Campaign and it may happen yet, but while the Persians are just about ready, but the Lydians aren't. Meanwhile some discussions and a test game of Black Powder has me curious as to whether it can really give a decent Colonial skirmish. My 54mm Sudan troops are all gone but for a few stragglers but I still have my handful of Nku Khu warriors (aka Zukus) and enough 1860's British troops to set some thing up. I was tempted to pick an old favorite but its time to try another as yet unplayed scenario from The Battlegames Table Top Teasers, Vol 1. Now where in this mess of a 1/2 moved into house, are my 54's and what do I still have 5 or 6 years after their last game? Since the number of figures per unit doesn't really matter other than relative size and looks, I'll skimp a bit and use 6 or 8 Brits in a single line as a standard unit and 10 or so natives as a warband or 6 as skirmishers. OK, a planned OB from memory then, when I clear the table and break out the troops, we'll see what troops can actually make it! New Durban has enjoyed peace for a decade now (see New Durban Times) , but with peace has come an influx of settlers and pressure to expand the boundaries into Nku Khu Land. A new settlement on the Kenabekhazi River has led to some minor violence and threats and Fort Belmont has been established to over awe the natives. It is the end of May and to the normal resupply convoy, a 4.7" naval gun has been added to beef up the fort's defenses. The aging rebel, TopHat hears of it and convinces Prince Kwannabe to take steps to stop the gun from arriving. Since virtually all of the rebel side were my old troops, the Spanish being the only exception, I took command of the Rebel army. Taking command 1/2 way through a battle is an awkward thing at the best of times and while I carefully listened to the reports of the morning's fight and of the enemy's likely positions and forces, the game was under way before I had a solid plan. When taking over a retreating army on the edge of the table with the enemy following,retreating a little farther seemed to make sense and so I did while pondering the geography and strategic aims as well as the possible rules which I was only noddingly familiar with. My commanders all served me well though as did the column bonus which pretty much guarantees at least 1 move per turn if you're careful and are lucky enough to not have a Brigadier blunder. It took a while to get accustomed to visually gauging cm instead of inches. Neither a 12cm command radius nor a 6cm brigade integrity rule give much leeway. On the southern flank, the Hessians advanced slowly up to the wood and Von Barner's light infantry began to trade fire with my riflemen. The Brunswickers, in close order in the open, were swiftly getting the worst of the firefight so fixed bayonet and charged. The rifles evaded back into the woods and then came back to resume sniping. Jerry deployed Barner's as skirmishers along the edge of the woods and the firefight resumed until eventually with 2 hits, Jerry pulled them back to a safe place where they became stranded out of command and unable to screen my riflemen. While this was going on, the Grenadiers reformed into columns and began to move past the wood with the dragoons on their flank. Suddenly a problem became apparent, the CV 7 Brigadier had trouble issuing 1 order let alone 2 or 3 and the Germans were too spread out to be controlled as a brigade. Jerry either had to keep trying to push ahead as best he could, choosing 1 unit each turn as the most important to move and occasionally getting lucky and moving several, or else stop for a turn or two to purposefully reform his brigade to make it easier to control. Having riflemen sniping from the flank, occasionally causing disorder or getting close enough to cause a -1 orders penalty did not help. The German dragoons (being subject to the 'marauder' rule that allows them to operate at any distnace from their Brigadier) advancing slowly up to the top of the hill but there they sat in column and waited for the infantry to catch up. It all seemed pretty minor at the time but in retrospect, those persistent riflemen may have been instrumental in preventing the grenadiers from advancing and cracking my center. 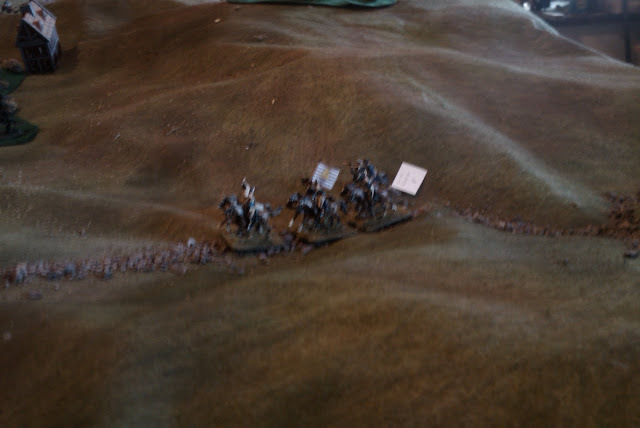 The remainder of the Hessians arrived from the south but the British were obviously bogged down and disorganized after having stormed the bridges as it was several turns before they finally showed up. 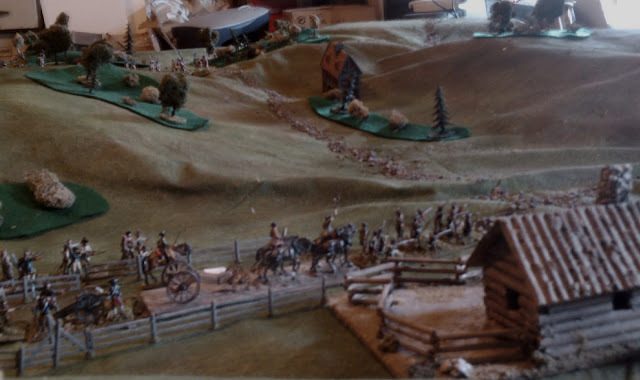 By now, with a large Hessian force moving up from the south, the French on hand and no British in sight, I was starting to formulate a plan and started moving troops to hold an 'L' shaped defensive line up the road and then refused back across a line of hills with the cavalry on my right. Delegating some units of the left and center brigades to act as a rearguard, I started moving the rest in column to my new position and soon found myself in the same position as Jerry, unable to move scattered forces efficiently. 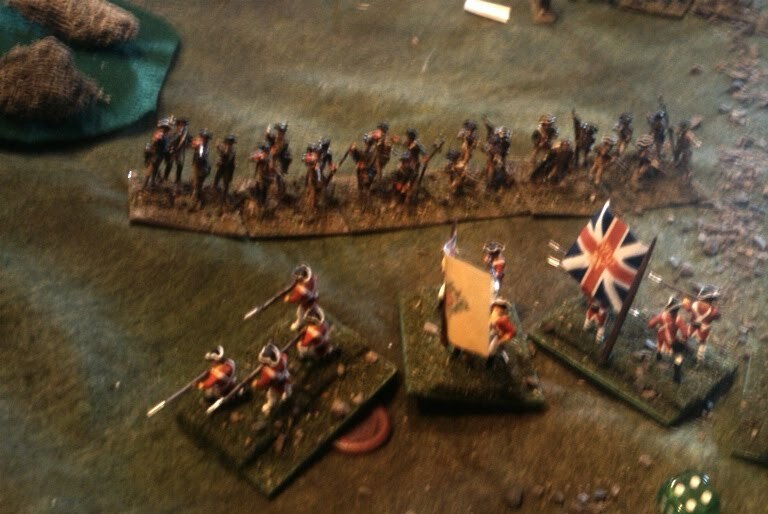 In my case, my personal figure was soon at hand to control the troops forming the new refused flank but before I could pull in my rearguard, the British appeared and I had no choice but to turn and fight. At last the remaining British forces marched on. I smugly pointed my cannon at his march columns only to find that my artillery was only allowed to fire at very conservative ranges. Forty eight inches may seem like a substantial shot but 48 cm doesn't get you far! No problem I thought, he'll be here soon, but as I waited and waited, there were more command control problems, a CV 7 general who couldn't roll low to save his life, and a command that was soon scattered as the light infantry deployed on one flank. Eventually, I began to drag my cannon forward and opened a desultory fire. Fighting was now general all along the line with the British Light Infantry charging into a woods full of militia who held turn after turn, giving as good as they got (thanks to the cover of the woods and some hot dice). Eventually the militia would break and run but the victorious light infantry were shaken and not fit to press the attack. By then, the rest of the brigade had turned and taking advantage of an serendipitous rear slope position, launched a counter attack on the rest of the British central brigade. One battalion was halted by fierce canister fire and eventually thrown back shaken to rally in dead ground but the other battalion supported by artillery surprised the grenadiers with a tremendous first fire. The grenadiers would make a fight of it but the end was almost inevitable, eventually they broke and ran and the remains of the center column was forced to beat a hasty retreat. When I say the grenadiers were 'shaken' I mean it! By now, the light was failing. To the south, the Hessian line brigade was pressing forward through a narrow defile defended by 1 battalion, a fierce fire fight resulted in the Americans falling back only to be replaced by a fresh unit which broke the leading Hessian regiment and then braced to receive the rest. On the heights, my cavalry had eventually made their way onto the high ground, just failing to catch the Hessian cavalry still in march column. My 1st squadron of Lauzon Legion Hussars charged supported by the second squadron and the American dragoons. A handful of 1's and 2's rolled out to my great alarm, made worse by the handful of disordering 6's leading the enemy's roll. Luckily I saved enough hits that the supports brought it to a tie. In the second round the luck changed and the Dragoons, narrowly defeated, rolled a 3 for morale and broke. 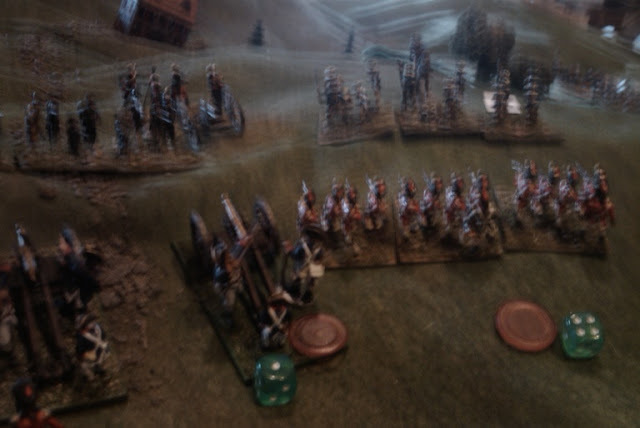 My battered squadron fell back while the fresh ones maneuvered around the flank of the Hessian Grenadiers. Finally, in the south, I became impatient and launched the 3rd NY and the Green Mountain Boys in a counter attack. Pressing forward, with the rest of the brigade moving up in support, my infantry turned on the Loyalist light infantry and routed them. With both British brigades broken and both of his remaining Hessian brigades in sticky situations, Jerry decided it was time to call off the attack and fall back to the river. So that was our first 20mm cm option AWI game. How did it go? Well, despite a cheering win, I thought it was great! The scale of the action and units on that size table meant that there were no flanks secured on table edges, many of the smaller AWI battles in the northern campaigns involved small forces and large distances and this captured that feel. Not only that, but we were able to handle 4 brigades per side, totaling a score of units each, playing a set of rules we were novices at, in a complicated situation, and play the game to a conclusion in a long afternoon with breaks, probably 5 hours of actual play time including looking up rules, maybe less, and I'm not sure how many turns, my guess would be 10. With 2 or 3 experienced players a side, we could easily have knocked it off in 3 hours. After my first small tests, I was concerned that the order mechanism would control the game but here, with multiple commanders and a better feel for the use of columns, brigade orders and initiative, I felt that despite occasional failures, over all, it was my decisions that mattered, not the die rolls and my battle plan unfolded as I envisaged it, the command occasionally slowing things rather than stopping them. The major impediment came from the enemy, not the rules. There are still some process quirks that irritate me but since it is not a process oriented set of rules and because they seem to give the right feel and results, I am willing to over look them. (for the curious, the main one is that I am uncomfortable with the way the attacker can always get first shot, this does reward aggressive play and mirrors the early 18thC British tactic quite well. I will content myself by observing that it may reflect a pyschological edge for the attacker and that the combat is really simultaneous despite the igougo game mechanism and so doesn't necessarily mean what it appears to. I also felt that the artillery might have had a slightly longer range, especially in a theater where ammunition might be less of a problem than in North America! f) lastly, if you are going to attack, attack! don't f**t around, 'slap, don't tickle' is the expression I think.Take the casualties and inflict them and have a reserve on hand. If you are defending or meaning to annoy the enemy, then sure, a little long range fire is ok but don't throw away troops in close firefights or charges unless there is a good reason. A thoroughly enjoyed game and I foresee more Black Powder games to come. The campaign was inspired partly by the limited historical armed rebellion here (http://en.wikipedia.org/wiki/Jonathan_Eddy) and partly by a desire to fight some games on home terrain (ie where we can walk the ground). To make it work, we supposed a slightly more populous and developed Nova Scotia but decided not to take the alternate history aspect too seriously as the main goal was to play some fun games with what figures we had available or felt like painting. The original battles were played in 54mm and then a series of 40 mm games were played in the same setting and following on from the 54mm games but which Jerry largely missed out on. These games all took place in Halifax and Hants West Counties. 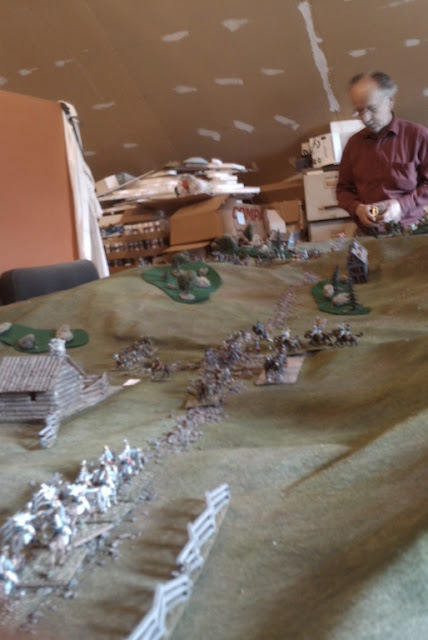 Two or so years ago, I dug out my 20mm (1/72) plastic AWI, armies painted in the 80's, Jerry added some of his own and King's County became the setting for a series of 20mm games. Life has been busy and Jerry and I haven't been able to game together as often as we would like so I passed him my troops and he has been playing some solo games, including some map moves. 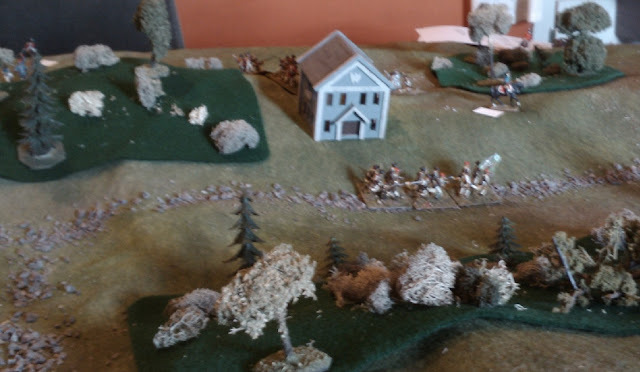 The last game he played, saw the Rebels with their Americans and French allies, defending a line along the Gaspereau River with their backs to Grand Pre (of Evangaline fame) and Wolfville, against a British and Hessian force advancing from Windsor. The Hessians attacked the Wallbrook bridge and outflanked the rebel line. After fierce fighting, a general retreat took place all along the line. At a vital road junction about 3 km to the rear, the rebels turned to fight again. This is the point where Sunday's battle begins (See previous post). 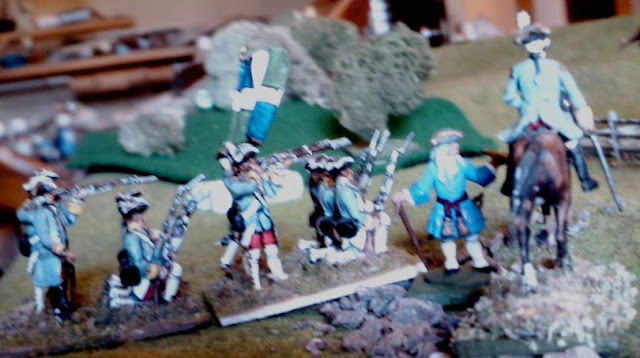 To avoid complications in translations between rule sets as well as tending towards making a better game, any units not deemed destroyed after the morning's fight were miraculously restored to full strength (with hind sight we could have assessed 1 hit on each unit that had taken losses earlier since one cannot rally off the last hit during a battle). Generally the stats were as used for the sample Saratoga game but the rebels had their Melee dice reduced by 1. Command Values established earlier in the campaign and used in BKC variant games were mapped directly into BP. A satellite view of the battlefield can be seen on google maps here: Grand Pre battlefield , but the table was terra-formed by Jerry after having walked the ground. Using cm and a 6x10ft table gave us an area roughly 3 km x 2 km to fight over. Since the whole campaign has been casually conducted, and the game was an opportunity grabbed, I don't have as much detailed information at my hand as I would like, for example, I don't have a complete list of units and commanders. My first 20mm armies began life with the plan of being used with a precursor of the original MacDuff rules and were going to have a charge like organization of 3 12 man companies but by the time Peter Douglas and I played the 1st game, we had settled on Konig Krieg as rules. 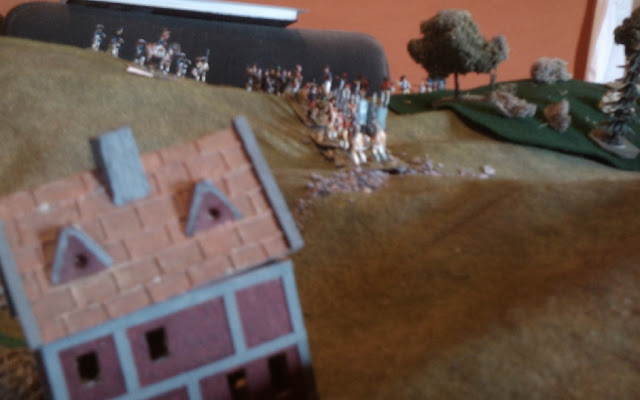 I later used these armies to develop the original version of Morschauser Meets MacDuff and Jerry was working on an 18thC version of BKC when Black Powder came out. It seemed like a good match so we decided to give it a try using the optional cm scale. The battalions we were using were largely based 4 figures on a 1.5" square base (iir), (loose files indeed) with 3 or occasionally 4 stands per unit. Right Brigade: CV 7 commander with 3 battalions and a detachment of riflemen, the attached militia having been destroyed earlier in the day. Independent squadron of dragoons reporting directly to the CV8 commander. 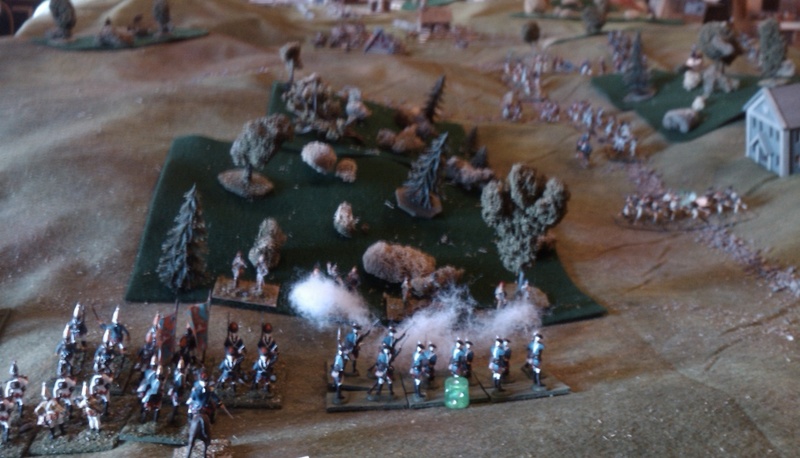 Off table to the north was a brigade of French and Spanish troops under a CV9 commander composed of 2 squadron's of Lauzon's Hussars, a battle of Legion infantry, a gun and a battalion of Spanish. These had to roll to appear and were in danger of being cut off if the Grand Pre cross road was taken by the British. 1st British ((south-east): CV8? commander with a battalion of Grenadiers, a battalion of Lt Infantry and 2 guns. There was also a detached battalion which had landed on the Grand Pre peninsula and were following the French. The next post will recount the over all battle, some particular events of interest and comments on BP, how it played, how it affected the game, command decisions etc. Rebel forces retreat onto the table at the start of the game. The Nova Scotian War of Independence in 1/72 plastic. A Black Powder game. Details in a day or so.